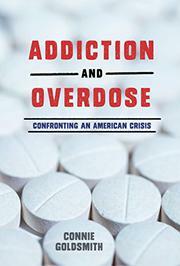 A chronicle exposing facts and challenges confronting drug addiction and overdose in America. Health and science writer Goldsmith returns with another formidable topic for young readers. Covering everything from the stigma of addiction to its effects on the brain and body, the book also divulges lesser-known information, such as the racial stereotyping that affects physicians’ behavior: “Doctors prescribe narcotics more cautiously to black patients.” Quoting a New York Times editorial, the text delves into how Congress has historically treated drug abuse as a disease afflicting mostly poor, minority communities by locking people up and observes how the epidemic of drug-overdose deaths is now ravaging white populations. In light of this, the book could have spent more time talking about the relationships between pharmaceutical companies and physicians. Goldsmith tailors some information to her audience: “More people start using illegal drugs between the ages of sixteen and seventeen than at any other age.” The design includes tips for teens, chapter summaries of statistics, charts, graphics, and photos, as well as relevant boxed-out information. While the information presented is thorough and the facts imperative, the dire subject matter does not make for a page-turner; important details, facts, and figures risk dilution by the dozens of accounts and examples reported.